THREE-MARTINI LUNCH first hit shelves in hardcover form last year. Now the book will be reborn as a paperback in a little over a week, on August 8th 2017. I'm still bogged down with quite a lot of work, but I thought I'd take a beat here to share a few fun factoids about my experiences re the hardcover to paperback process with the uninitiated who happen to be a tiny bit curious about publishing. First, the book's design. With my first novel, THE OTHER TYPIST, the publisher decided to keep the same cover on the book as it transformed from hardcover to paperback. But oftentimes, publishers will create an entirely new cover for the paperback. The old wisdom used to be that the hardcover would get a more "literary" cover (and usually more on the illustrated side), and then the paperback would get a more "commercial cover" (more typically involving a photograph). Publishing is a rapidly changing beast though, and I've found that these old school cover rules are certainly not set in stone, so take this with a grain of salt. In any case, THE OTHER TYPIST didn't get a different paperback cover, but THREE-MARTINI LUNCH did. It's interesting to see, and I certainly appreciate all the work that goes into restyling the book and all its promotional materials. On that note, I'd like to share the updated "Book Club Kit" that the Penguin people created and updated for THREE-MARTINI LUNCH's paperback release (below). If you or anyone you know is interested in picking up the book, I'm happy to pass the "kit" in PDF form to all who'd like to have these materials and possibly print them out for a book club meeting. Which brings me to paperback point number two: Paperbacks are more affordable (duh), so they make better book club recs. Having your book come out in paperback is a cause for celebration, because when a new friend or acquaintance says, "Oh, I want to buy your book!" you no longer have that twinge of guilt about the whopping twenty-five bucks the hardcover is likely to cost a person these days. I remember someone from Penguin (I think it was someone who ran one of their paperback imprints, so...) telling me the old saying, that "a book really LIVES in paperback." As someone who herself spends way more money than she should on books, I can get onboard with that. It’s been a while since I’ve posted here, and part of the reason for that is because I’ve been writing like a lunatic. The nice thing about writing like a lunatic is that it means you actually finish stuff… like a new novel. Yep, I turned in my book and my publisher has accepted it. They’re saying it’ll hit shelves in Summer 2018, and hopefully I’ll have more specific details to share soon as things shape up. The act of turning in my new book, coupled with some recent travel, really got me thinking. When you travel you often cross paths with lots of different people (you sit next to someone on an airplane or chat with new acquaintances at a wedding – these sorts of interactions). People will say, “Oh, how exciting – you’re a writer! What should I read of yours? Would I like your books?” It’s a very kind question. And… willing readers! Wow. People can be awesome, and God bless people who still occasionally opt to read a book instead of binge-watch Netflix – amiright? In answering the question, I find myself picturing the person sitting down to read one of my books, and I always wonder, “Is my book their type of book? Will they like it? Are they going to be like, ‘What the eff is this?’ ” Because… you know… not every book fits every reader, and for better or worse I feel pretty aware of what someone may or may not like about my first two books. My second book (Three-Martini Lunch) has three first-person narrators. I’ve found readers either love that kind of thing or hate it, and there are very few who land somewhere in between. And while my first book erred on the side of “girly-ness,” my second book has two male narrators and one female – I was told it consequently had significantly less “women’s fiction” appeal. Furthermore, the voices were very stylized (for instance, one of the male narrators talked like a Jack Kerouac-wannabe). They were interesting but flawed characters, and I think if you’re the type who needs your books to contain likable characters who always make likable choices, my second book might be a tough sell. Then there’s also the fact that I’m a politically-left-leaning person (sorry, but most writers are). So that’s going to show up in some of the stuff I write. When I picture some ultra-conservative member of the Tea Party reading, say, my second novel – a novel that is very critical of 1950s-era white male patriarchy – I’m thinking, “Hmm, this person might not love this book.” And you know, that’s okay. They don’t have to. As a writer, one of the questions you must constantly ask yourself is about your perceived audience: “Who am I writing this for/who can I picture reading it?” And it’s probably a good thing if you can accept that old proverb, “You can please some of the people all of the time, and all of the people some of the time, but you can’t please all of the people all of the time.” MFA students, for instance, often take a lot of heat for writing in such a way as to please their fellow MFA students, their professors, etc. I actually have no dog in that fight. I find I sometimes read and very much enjoy books by authors considered “writer’s writers” – which means exactly how it sounds: Writers who’ve studied the craft in depth who write for other people who’ve also studied it. The frequent complaint is that they’re writing for far too narrow an audience, but if you think about it: There’s a sort of language-within-a-language to be appreciated there. It’s not like academics who write criticism aren’t doing the same thing (i.e. communicating via a coded convention, a language-within-a-language). We seem pretty okay with the expectation that academics are writing for a smaller, more specific audience. Anyway, I’ve gotten away from my point. Ironically, the point I’m about to make will now fly in the face of everything I’ve written in this blog entry so far, and that is: My third novel, Eagle & Crane – the manuscript I just turned in – is about as close as I’ve ever come to writing something for EVERYBODY. Instead of realizing I’ve written something for a narrow or niche audience, I feel like… well, it turns out I kind of wrote this for about the widest audience I can imagine. It’s pretty balanced in terms of gendered appeal, I think. It contains a mystery plot that hopefully keeps the pages turning, but it’s also driven by character development. There’s love, there’s tragedy (but also happiness/upbeat events, too), there are epic generational tales and also an historical backdrop of political turmoil. The writing (I hope?) makes it an easy read and it’s told in a fairly straightforward third-person voice (as opposed to some of my other prose experiments). There are likable characters and a twist ending that is not at all ambiguous (there you go, annoyed/anguished fans of The Other Typist, I present you with a twist that resolves itself with lots of clarity; I hope you like it!). I have no idea how I’ll feel about it in three months’ time, six months’ time… or a year from now when it finally hits the stands. I also know that it is IMPOSSIBLE to write a book that everyone loves. Books are definitely NOT one-size-fits-all. But as of this moment right now, it feels like I’ve written something I could pretty much recommend to anyone and not be too embarrassed to picture various different individuals reading it and trying to get into it (as a writer, if you have any humility at all, it’s always a little bit embarrassing to picture someone reading your book – a tiny hint of that being-caught-naked-feeling). Perhaps it’s the subject matter itself, or the voice and tone – but for whatever reason, I feel like this book is genuinely easier to recommend to people from all different walks of life. I really hope that’s a good thing. In any case, I’ll insert the brief blurb from Pub Marketplace that describes Eagle & Crane below. Descriptions from Pub Marketplace tend to be almost tweet-length, so this won’t be too illuminating but at least it will give you an idea of my new novel’s topic until we can settle on some good jacket copy. Thanks for reading! 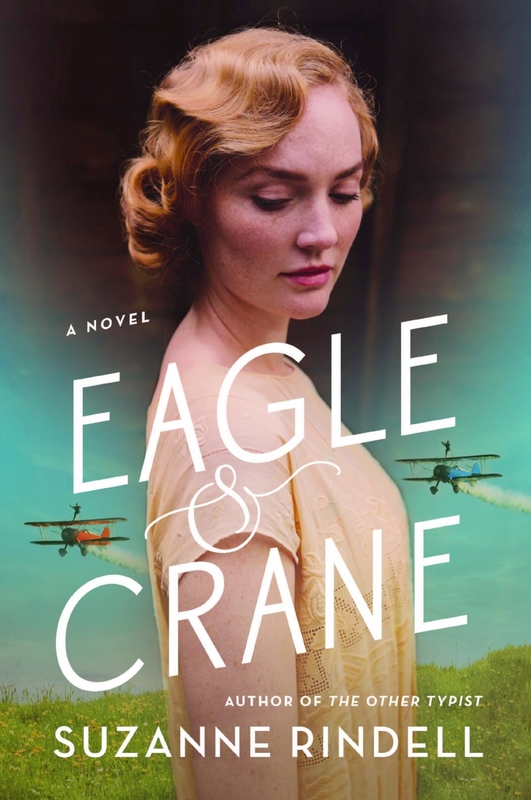 EAGLE AND CRANE, set in the world of a 1930s flying circus in California, about two young aviators -- one of them Japanese American -- and the girl next door who loves them, focusing on the effects of Pearl Harbor on their relationships and the fate of their daredevil act. ***This piece originally appeared in The Irish Times. Read it in its original format online here. In my novel, Three-Martini Lunch, one of my characters wants to make it as an editor in the world of New York publishing. Given that she’s a woman and the year is 1958, she encounters the kind of sexism you might expect when you watch an episode of Mad Men. Female editors were rare in those days, and most only edited cookbooks and children’s books. Fast-forward to the present: nowadays this aspect of my plot would be unthinkable. According to a 2015 survey conducted by Lee & Low, women make up 78 per cent of publishing’s overall workforce, and 84 per cent of the editorial field. More and more, statistics show that publishing is becoming almost uniformly run by straight white women. This lack of diversity – especially the lack of minority representation in the business – is both puzzling and troubling. It is clear something needs to be done to ensure a more inclusive, diverse workforce. But circling back to Eden, my thwarted female wannabe-editor in Three-Martini Lunch, I find myself curious about the current gender trend, too. It seems women cracked into the field and have taken over. But it begs the question: where have all the men gone? I decided to ask my editor, Jake Morrissey, for his opinion. He is, after all, a man and an editor and therefore something of a rarity, according to the statistics. I asked him: just for the sake of argument, let’s assume there is a set of men who would’ve pursued publishing back in the 1950s, but in today’s world are doing something else. What happened? Did they get edged out by their female competition? Lured away? If you had to make a wild guess, what are they doing instead? While Jake made it clear this was only an off-the-cuff guess, there is certainly data to suggest his impression bears out some logic. Publishing salaries are notorious for being stuck in the past, not increasing to scale with inflation or comparable professions (such as those Jake named). According to Publishers Weekly’s 2015 salary survey, an editorial assistant makes as little as $25,500, while a senior editor averages $70,000. Take into consideration that to work in publishing in the States, you must live in or near the New York City area, and suddenly that (coveted! competitive!) editorial position starts to sound less like a job and more like a passionate pursuit that comes with a vow of poverty. The fact women have come to populate this industry to the point of making up its majority suggests they are not put off by the ratio of education required versus dollars paid. Or, if they are put off, there are other factors that atone for this lack of salary – such as placing a higher value on passion over pay, or even harbouring the expectation (either conscious or unconscious) that the salary gap will be bridged by a partner. Of course, without conducting a true case study, this – just like Jake’s guesses about why there are fewer men in publishing than previously – is mere conjecture. But consider this: Two other facts consistently reported by these surveys are: (1) women’s salaries in publishing trail men’s by an average gap of $20,000, and (2) while women make up a whopping 84 per cent of editors, this majority drops to 59 per cent at the executive level. If my character, Eden, were a real person living today, I would salute her desire to become an editor and I’d assume her gender wouldn’t hinder her chance to achieve this goal (as it almost definitely would have in the 1950s). I would, however, still warn her not to bump her head on the glass ceiling. The matter is clearly more complicated than simply whether or not the publishing industry has decided to let women in. This article originally appeared on the Female First website. You can read it here. According to Lee & Low's recent survey of the industry, a whopping 79% of New York's publishing workforce identifies as white/Caucasian. That clearly presents a problem, most especially because publishing is meant to be a culture-making industry, an industry that shapes the literature (and therefore - if it's not too optimistic to say - the culture) of the world around us. Let's talk now about a different survey: A Publishers Weekly's 2015 salary survey indicates that here in the States the average salary for an editorial assistant is $25,500. That's less than £18,000. The center of American publishing is New York, and much like London, New York is a city where the cost of living is so stupidly expensive you can't read a newspaper or click online without coming across five fresh articles each day about how normal people can't afford to live here anymore.
" Looking at publishing today, it's an industry that rewards endurance. You have to be willing to come in at a young age, stick around for not much money, and hang on for as long as your checkbook balance or enthusiasm allows." The "rich" - and by this I mean someone with a trust fund or even simply a young person with a helpful mum and dad - are able to work for little or no salary, since money isn't an object. The "crazy" work in publishing by day and do a second job (usually waiting tables) by night. They often burn out due to exhaustion. That leaves the "lucky." I myself was "lucky," in that when I moved to NYC, I found a freakishly cheap apartment and thus was able to live off my savings a little bit while I took an unpaid internship at a literary agency so I could get my foot in the door. There was a reason, of course, the apartment was so cheap: It was located above a funeral home (you actually had to enter THROUGH the funeral home, and yes, I sometimes glimpsed corpses laid out in caskets…!). My point in explaining all this is to illustrate the fact that choosing to work in publishing is something of a luxury in today's economy. When executives and editors alike scratch their heads and wonder why the seemingly liberal publishing industry is failing to draw in a more diverse workforce, they need to consider other demographics as well - namely, the correlation here in the U.S. between race and socioeconomic status. Entry-level publishing jobs may simply not be an option for individuals under pressure to make a more immediately practical choice. This pressure perhaps doubles for the children of immigrants wherein "choosing" the low-paid career path that publishing offers would be perceived as both betraying the investment that has been made in their university educations and shirking their generational responsibility to shore up family stability. Having worked in and around the publishing industry for six years now, I love and admire the people I've worked with, but more and more I feel it's time to face the music: It takes a certain culture of white privilege to move to New York, take an entry-level job in publishing, and assume it will all work out. In my opinion, the diversity problem - at least in part - begins before university grads even pack their bags and move to the Big Apple. We need to give some thought to who can't afford to pack that bag, and why.